A LOCAL sports club wants to attract more older members while simultaneously raising money for a charity in Wrexham. 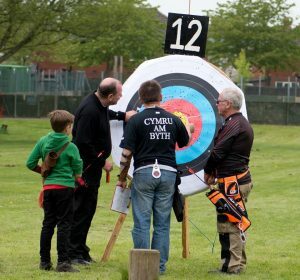 Liam Gotting from The Leader spoke to key members of Wrexham Bowmen Club, who have said they would like to gain more members of an older age, stating that they are living proof that you are never too old to pick up a bow. Howard Verrier, Child Protection Officer of the club, told me how he didn’t get into the sport until later in life, as well as how archery helped him to actually recover from surgery. “Just look at me, it wasn’t until I was 68, nearly 69 before I even went on a beginner’s course, three years on from that now and I’m a qualified trainer. 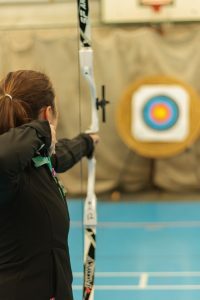 “In terms of exercise, I had a major operation on my shoulder, I had rotator cuff repairs and bone spurs removed from my left shoulder, but I found with archery, it’s almost like physiotherapy because of the nature of the movement. The Wrexham Bowmen have been around for 50 years, currently shooting on Sunday’s between 10am and 2pm at St. Christopher’s School, and welcome members of all ages, citing their youngest member as 12-years-old, and their oldest at 78. Wanda Emm, Secretary of the club, cited the exercise as another reason for joining the club as an older person. “It can be very light exercise, but it can also be much bigger exercise depending on how much you want to make it. Graham Jones, Chairman of The Wrexham Bowmen added that archery can re-spark competitiveness or it can just be a relaxed, social sport, but also admitted that the sport has suffered due to lacking funds over the years. “There are plenty of competitions throughout the year, we run our own club competitions and one in April that is open to other clubs in the area as well. “You can enter these and be competitive and try rise up the ranks, but you don’t have to, if you just want to come and have a fun shoot, fire some arrows off and have a chat with other members then you can do that as well. “We shoot every week and it’s addictive, it’s absolutely addictive, there’s no doubt about it. The Wrexham Bowmen are not just a club for fun, but also hold events to support worthy causes across Wrexham, and during an event in late-2018, they managed to raise nearly £500 for Nightingale House Hospice on Chester Road. Mr. Jones and Mrs. Emm presented a cheque to Nightingale House on Thursday, February, 14, and at the event Mrs. Emm explained how the club raised the money and expressed just why they chose the hospice as the charity to donate the money too. “We held a competition called ‘A Penny A Point’, so everybody gave in minimum six pounds, but many people got sponsorship forms. It was an in-house competition between the members, but it was all in good fun, just to raise money for a great charity. Mr. Jones went on to add his thoughts about the extent of Nightingale House’s impact on Wrexham. “I think it’s fair to say that everybody knows somebody who has been supported by Nightingale House. “Irrespective of whichever political party is in charge of government, the administration doesn’t put enough funds available for these places, and without, not just Wrexham Bowmen, but the generous donations of all other sports clubs and everything else, these places wouldn’t survive, simple as that. Mr Verrier added: “I became a coach at 71, I’m now 72 and I’ll be doing this for another 40 years yet.